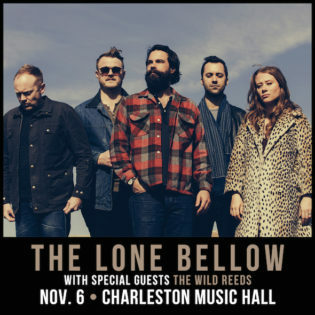 Charleston Music Hall presents The Lone Bellow with special guests The Wild Reeds on Monday, November 6th, at 8pm. Tickets range from $18.50 to $25 with a dinner & show option available for an additional $32. Then Came the Morning, the second album by the Southern-born, Brooklyn-based indie-folk trio The Lone Bellow, opens with a crest of churchly piano, a patter of drums, and a fanfare of voices harmonizing like a sunrise. It’s a powerful introduction, enormous and overwhelming, as Zach Williams, Brian Elmquist, and Kanene Pipkin testify mightily to life’s great struggles and joys, heralding the morning that dispels the dark night: “Then came the morning! It was bright, like the light that you kept from your smile!” Working with producer Aaron Dessner of the National, the Lone Bellow has created a sound that mixes folk sincerity, gospel fervor, even heavy metal thunder, but the heart of the band is harmony: three voices united in a lone bellow.